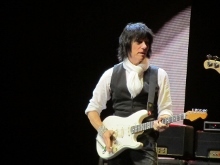 Having attended two of the three previous Crossroads Guitar Festivals (the first in Dallas, as well as the most recent in Chicago), we weren’t all that sure what to think about last fall’s announcement of the 2013 installment of the renowned festival. 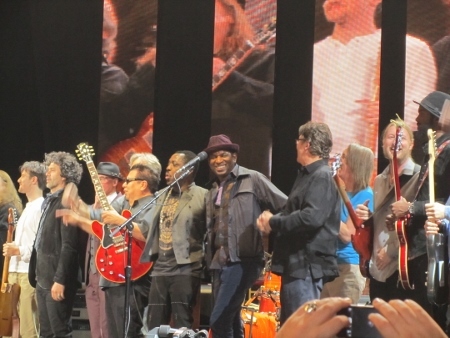 Sure, the line-up was solid enough, as is always the case, but in addition to the moves to both a new city and an indoor arena (in NY’s famed Madison Square Garden), the 2013 event would also for the first time be spread out over two nights rather than taking place during a single full day. This of course led to a whole range of new questions and decisions for interested fans, among them, which artists would be performing which night? which, if any, might play both nights? and would the second night of performances be worth an additional night’s hotel in one of the world’s most expensive cities, on top of the premium ticket prices? For Crossroads faithful such as ourselves, there was really only one way to get the answers to these questions, and we’re pleased to report that the past weekend’s affair was, collectively, the best Crossroads yet, featuring superb performances from host Eric Clapton, other established acts like the Allman Brothers Band, Buddy Guy, Jeff Beck, Taj Mahal, Booker T. and Steve Cropper, Robert Cray, and Vince Gill, and such rising stars as Gary Clark Jr., Doyle Bramhall II, Quinn Sullivan, and Philip Sayce, along with a whole lot in between, from John Mayer, Earl Klugh, and Sonny Landreth to Keb Mo, Robert Randolph, and Jimmie Vaughan. Doyle Bramhall II followed with a short acoustic set, bringing on John Mayer for “Change It,” a song written by Bramhall’s father for friend Stevie Ray Vaughan. 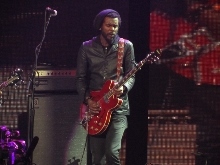 Coincidentally, Vaughan’s brother Jimmie happened to be the next act to take the stage, starting on the always-chilling “Six Strings Down” about the death of his brother and many other blues guitar players, made somewhat less haunting this particular night by the sweet voice of Susan Tedeschi singing along just next to us in the aisle. Newcomer Blake Mills did a few songs next, first solo, then partnering with Derek Trucks on “Save the Last Dance for Me,” followed by an intriguing set from Los Lobos. 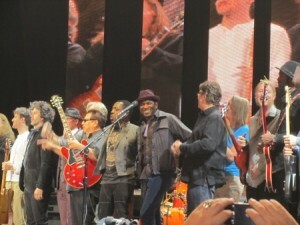 Starting on a rocking “Burn It Down” that allowed us to again hear from Susan Tedeschi (this time on the stage where others could also appreciate it), the set also included guest appearances from Robert Cray – providing some terrific vocals on “Just Got to Know” as members of his own band cheered him on from the audience – and Clapton. 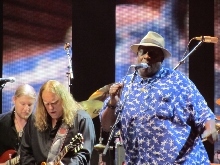 Despite our best efforts, we didn’t get to see Taj Mahal and Keb Mo when they toured together a few years back, so it was nice to have the chance to see them team up for even a short set, digging in on “Walking Blues,” followed by Taj on vocals for “Diving Duck Blues,” and then Keb doing “That’s Alright,” making for one of our personal favorite sets of the festival. With Robertson’s exit, Andy Fairweather Low stepped into the coveted guest spot, taking the lead on a delightful “Gin House Blues” that included a burning solo from Clapton before turning it over to the festival host, who, with his band, tore through many of the best songs from their current tour in a “Got to Get Better in a Little While” that simply gets better every time we hear it, “Crossroads,” “Little Queen of Spades,” and “Sunshine of Your Love,” with Clapton also slipping in a “see you in three years” to provide hope that this wouldn’t be the last chance we’d all have to witness the type of mastery and unique pairings we did these past two nights. 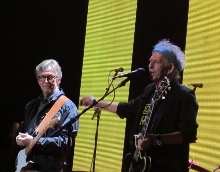 As good as it was to see Clapton perform these songs the weekend before during his tour stop in Pittsburgh, he and his band were even more spectacular this time around, with a full weekend of guitar talent apparently helping even him achieve new heights. Indeed, about the only thing that could have made his set any better would have been the inclusion of “Badge,” but we’re certainly not complaining, as Clapton clearly accomplished not one, but two, pretty remarkable feats on the weekend, putting in both his own best Crossroads set in addition to the best Crossroads festival overall. 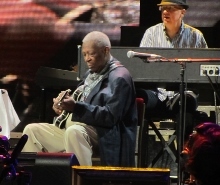 Anyone who might be starting to think that Clapton’s Crossroads festivals are the same from one to the next will want to be sure to check out the upcoming DVD of this latest installment. 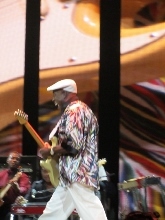 Not only has the festival continued to feature some of the most masterful pairings we’ve ever seen, but the two-night structure this time around also allowed for a much greater diversity of performances from many of the artists – particularly those who played both nights – than previously possible, including, for example, both acoustic and electric acts from the likes of Clapton, Buddy Guy, Gary Clark Jr., John Mayer, and the Allman Brothers. Seeing either night of the festival would have been enough to ensure that you’d leave happy, but experiencing both nights was nothing short of priceless. See you in three years, indeed. This entry was posted in Shows and tagged Albert Lee, Allman Brothers Band, Andy Fairweather Low, B.B. 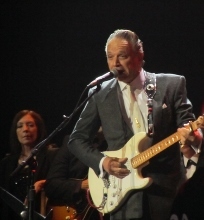 King, Beth Hart, Blake Mills, Booker T., Buddy Guy, Cesar Rosas, Citizen Cope, Crossroads Guitar Festival, Dan Aykroyd, David Hidalgo, Derek Trucks, Doyle Bramhall II, Earl Klugh, Eric Clapton, Gary Clark Jr., Gregg Allman, Jeff Beck, Jimmie Vaughan, John Mayer, Keb Mo, Keith Richards, Keith Urban, Kurt Rosenwinkel, Matt "Guitar" Murphy, Philip Sayce, Quinn Sullivan, Robbie Robertson, Robert Cray, Robert Randolph, Sonny Landreth, Steve Cropper, Susan Tedeschi, Taj Mahal, Vince Gill, Warren Haynes. Bookmark the permalink.